Darren Wilson’s lawyers describe legal strategy to stay quiet, consistent. 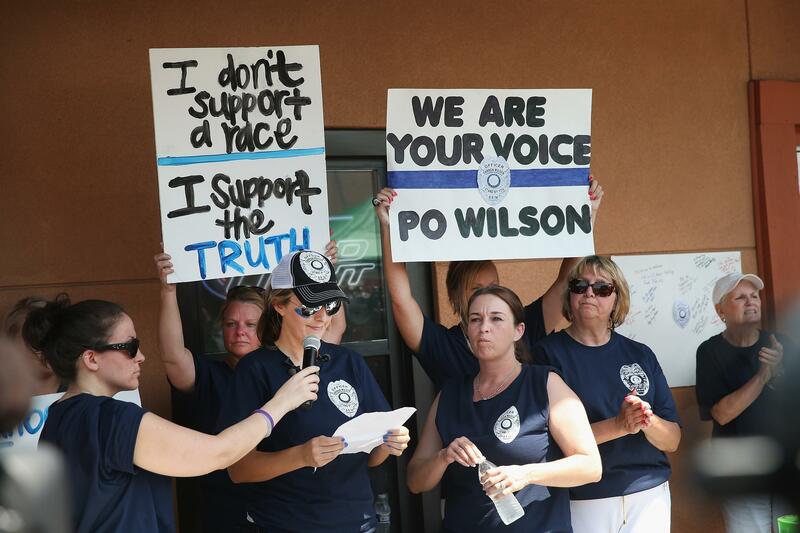 Supporters of Ferguson police officer Darren Wilson in August. They determined quickly after the shooting that Wilson shouldn’t speak publicly — in contrast to George Zimmerman, a volunteer watchman who in 2012 shot black teenager Trayvon Martin — because it could only hurt his case… He stayed silent publicly, and when he spoke to investigators and jurors, his version of events remained consistent… As the grand jury proceedings moved along over the past few months, Wilson’s lawyers — a group familiar with representing police cases — said they felt confident that they had the upper hand. That’s largely because witnesses who did speak publicly told conflicting stories about the 90-second encounter between Wilson and Michael Brown. If the grand jury had determined that Wilson should face a criminal trial, they would have had plenty of ammunition when cross-examining witnesses, they said. The lawyers also recount the lengths Wilson went to in order to stay out of sight for more than three months following his Aug. 9th shooting of Michael Brown. [The lawyers] also described a period of life on the run in which Wilson bounced from house to house but rarely went out in public… One Wilson lawyer, Neil Bruntrager, said that Wilson used “certain [disguise] tricks” he’d learned as a police officer to go out incognito, without specifying what they were. He preferred going to movies because of the darkness.